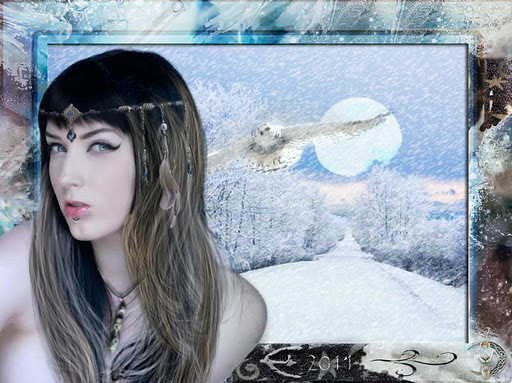 This one is called “The Believer”, the first work on a series of photomanipulations featuring my Canadian friend and icon muse Sierras on praise of the Celtic Moon Goddess. This one is called “The Acolyte”, the second work on a series of photomanipulations featuring my Canadian friend and icon muse Sierras on praise of the Celtic Moon Goddess. 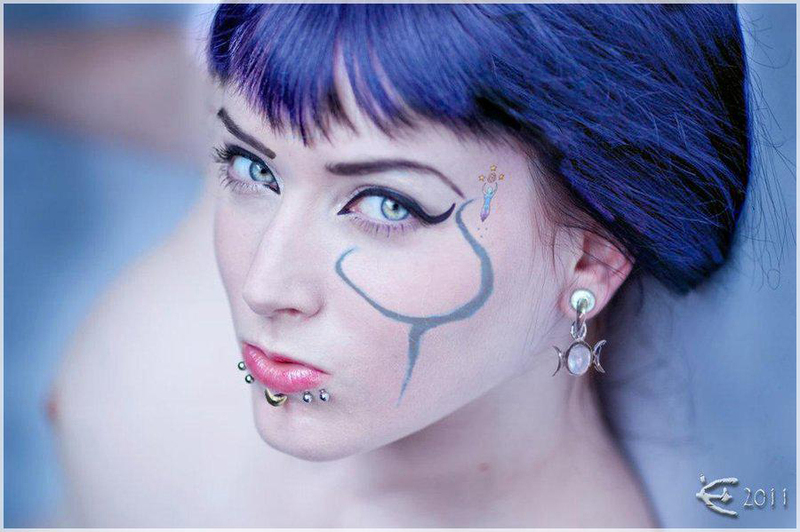 Model Source of Inspiration – Photo by Kind of Blue in Green Photography,July 2010. This one is called “The Priestess”, the third and final work of a triad on a series of photomanipulations featuring my Canadian friend and icon muse Sierras on praise of the Celtic Moon Goddess. of the many names and many lands. Model Source of Inspiration: – Photo by Kind of Blue in Green Photography, July 2010. As I commented on a previous post, Rhiannon is probably a reflex of the Celtic Great Queen goddess Rigantona and may also be associated with the horse goddess Epona. 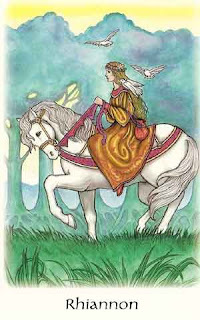 Some also associate her to the Irish “Macha” and the Gaulish “Epona“, the “Great Mare” derived from the inferred proto-Celtic *ekwos ‘horse’; I guess it is because of her horse association as depicted on the Welsh Mabinogion, which does not present Rhiannon as anything other than human, descibed riding a white horse, and afterwards condemned to carry visitors on her back for being suspected to murder her own son. Rhiannon thus bears the stamp of two important Gaulish cults: that of the “Horse Goddess” Epona on one hand; and Matrona, the “Great Mother”, on the other. Rigantona ‘Great Queen’, as Rhiannon would have been known in Romano-British times, is best considered a local variant of this composite figure. According to Phyllis Pray Bober, (reviewing Réne Magnen, Epona, Déesse Gauloise des Chevaux, Protectrice des Cavaliers in American Journal of Archaeology) , unusually for a Celtic deity, most of whom were associated with specific localities, the worship of Epona, “the sole Celtic divinity ultimately worshipped in Rome itself,” was widespread in the Roman Empire between the first and third centuries CE. 18th December is the day on which the celebration was held by Romans. It was the day when all the cloven-footed beasts – horses, donkeys, cattle, oxen – were rested and not made to work. A south Welsh folk ritual call Mari Lwyd (Grey Mare) is still undertaken in December – an apparent survival of the veneration of goddess Rhiannon. The pantomime horse is thought to be a related survival. The Mari Lwyd (Grey Mare or “Gray Mary” in English), also Y Fari Lwyd, is a Welsh midwinter tradition, possibly to celebrate New Year , although it formerly took place over a period stretching from Christmas to late January. It is a form of visiting wassail, a luck-bringing ritual in which a the participants accompany a person disguised as a horse from house to house (including pubs) and sing at each door in the hope of gaining admittance and being rewarded with food and drink. The Mari Lwyd consists of a mare’s skull (sometimes made of wood, or when the custom is followed by children, cardboard) fixed to the end of a wooden pole; a white sheet is fastened to the back of the skull, concealing the pole and the person carrying the Mari. Two black cloth ears may be sewn onto the cloth. Coloured ribbons are usually fixed to the skull and small bells attached to the reins (if any) by which the Mari is led. Mr Vernon Rees, a freeman of Llantrisant, remembers that his father, Tom John Rees, was in charge of the Llantrisant Mari. The Llantrisant head was not a real skull but was made of wood, bandaged right down to the snout to make it look like a genuine horse’s head. Mr Rees remembers the Mari being kept in the cupboard under the stairs and knows it was still around in 1937, when the family moved house. Tom John Rees was a miner at Ynysmaerdy Colliery, just north of Llantrisant, and died of pneumoconiosis in 1945, when he was only 45 years old. Mr Rees does not know whether his mother gave the Mari Lwyd away or what became of it. The Mari party (five or six men or boys) often had coloured ribbons and rosettes attached to their clothes, and sometimes wore a broad sash around the waist. There was usually a “Leader”, smartly dressed, who carried a staff or stick, or a whip, and sometimes other stock characters, such as the Merryman, who played music, and Punch and Judy (both played by men) with blackened faces; often brightly dressed, Punch carried a long metal poker and Judy had a besom broom. The custom used to begin at dusk and often lasted late into the night. Now it may start earlier in the day (as at Llangynwyd, where it begins at 2pm on New Year’s Day). During the ceremony, the skull is carried through the streets of the village by the party; they stand in front of every house to sing traditional songs. The singing sometimes consists of a rhyme contest (pwnco or pwngco) between the Mari party and the inhabitants of the house, who challenge each other with improvised verses (traditionally exchanged through the closed door); the contest could last for some time, until one side gave up. The tradition started fading through the first half of the twentieth century and had pretty much become extinct during the Second World War. Nowadays, some folk associations in Llantrisant, Llangynwyd, Cowbridge and elsewhere are trying to revive it. Llantrisant’s Mari Lwyd custom was revived nearly two and half decades ago by members of the Llantrisant Folk Club, very much in the style in which it was being performed when it originally died out, probably at the start of the Second World War. Rhiannon: Her conception as "Goddess Of The Dead"
As I already commented on a previouspost, it is acknowledged that the Mabinogion is the mostvaluable written source where the character of Rhiannon appears. (a tale that recounts how Pryderi ,-who survived the war inIreland-, offers his own realm to Manawyddan and gifts him his mother, Rhiannon to be Manawyddan’s wife). According to J A MacCullogh, in his book”The Religion of the Ancient Celts” the story of Rhiannon iseven more complicated, since the Mabinogion was not originally written down,but was memorised and retold countless times, before it was first translated byLady Charlotte Guest of Dowlais, Merthyr Tydfil, in the 19th century, andmoreover it is well accepted that ancient Celts never wrote downtheir history or mythology, so much of what we think we know is told throughoral recountings. Rhiannon was originally the daughter ofHefydd Hen (aka Heveidd Henn , Hefaidd Hen), “the Ancient”, himself aWelsh God or hero though no recorded story explains his mythical function, andwas probably a very old Goddess. As shown on Pwyll Pendefig Dyfed Pryderi was her son, and two candidates are given for the role of his father: “Pwyll” and”Manawyddan”. MacCullogh suggests that Manawyddan andRhiannon were aspects of older gods and parents of Pryderi, the dying andreborn god. (A theme which occurs in many religions.) Manawyddanbecomes Pryderi’s foster father, in some versions of the story, and later,Pryderi gives Rhiannon to Manawyddan in marriage. As in Irish myth, we discover here thetheme of a mortal helping a deity in the Other World while assisting Arawn, kingof the Annwn (the Welsh Otherworld or Underworld), and while doing so meets Rhiannon whoalso retains the Goddess Epona on her character, and appearing unto Pwyllriding a white mare from a magic hillock. The recurrent motif of the “FairyBride”. Thus it is considered that her divinequalities as Rigantona “The Great Queen” were diminished in order to marry a mortal man. Her rise and fall andchange into death Goddess in either case, it illustrates the dangers thatbefall Goddesses when they take up with mortal men. Being connected to Mórrígan the Goddess of War whose name resembles hers (Mórrígan has some of itslinguistic roots) especially because Rhiannon is associated with birds, in hercase three magical birds who fly always around her shoulders, singing sosweetly that the dead awaken and living fall into trance. Rhiannon: Her Conception As"Horse Goddess" and "Sea Goddess"
As I already commented on a previous post, it is acknowledged that the Mabinogion is the most valuable written source where the character of Rhiannon appears. (a tale that recounts how Pryderi ,-who survived the war in Ireland-, offers his own realm to Manawyddan and gifts him his mother, Rhiannon to be Manawyddan’s wife). Let’s recall that when Rhiannon gave birth to her son, Pryderi, at the Winter Solstice, he disappears while in the care of six of Rhiannon’s ladies-in-waiting , and the servants panicked. They schemed and decided to put puppy blood on Rhiannon’s face as she was sleeping, and scattered puppy bones all around her. Rhiannon is forced to do penance for her supposed crime, since everyone believed Rhiannon had eaten her baby. As punishment, she humbly stood at the castle gates with a horse’s collar around her neck. So the story of how Pryderi vanished mysteriously and was then reborn from the womb of a horse illustrates that belief. Although the myth of Rhiannon appears to be a straightforward story, in which a Goddess is falsely accused of murdering her child and suffers unjust penance imposed on her by humankind, it is the history of the cult of Rhiannon. In which she is venerated as a great queen and mother; her cult is corrupted and she is degraded to her most basic form, the horse; and then her cult is revived as her son is reborn, but she changes into the Goddess of the underworld through her association with the sea god’s son Manawydan fab Llyr. 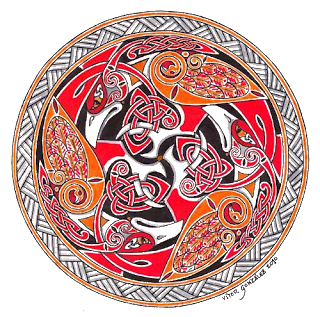 The Celts did absorb some of the older faith into their own, taking basic deities and complicating them with myths. There was a tradition whereby the King had to reaffirm his place by first mating with a sacred white mare and then cooking and eating her flesh and bathing in the water that was left after the horse’s bones were boiled. The mare was the symbol of the Goddess and the King had to become Her consort in order to rule. The Mother GOddess was the conduit through which the souls of the dead could pass into the Summerlands and be reborn again. The only relation specificially mentioned between Pwyll and Manawydan is that Pryderi gave his mother Rhiannon in marriage to Manawydan after thedeath of Pwyll, Pryderi’s father and Rhiannon’s first husband. Manannan mac Lir’Manannan, Son of Lir’, was an Irish sea-god (OI leir, ler, ‘sea, ocean’)and eponymous hero-god of the Manxmen, whose island was named after him. He also is directly related to the Welsh sea-god Manawydan fab Llyr. Like many of the primal IE ocean gods, Manannan was older than the Danann sky gods, yet was considered one of them. Though Manawyddan is involved in almost all the events of the Mabinogi of Branwen ferch Ll±r he is there as an observer. His only real role is to be one of the seven survivors of the Brythonic invasion of Ireland to return to Britain with Brân’s head. His story really starts in the next tale, the Mabinogi of Manawyddan fab Llŷr. After the events of the Mabinogi of Branwen ferch Llŷr, Manawyddan is the only man left without a realm and Pryderi (who also survived the war in Ireland) offers his own realm to Manawyddan and gifts him his mother, Rhiannon to be Manawyddan’s wife. It is acknowledged that the Mabinogion is the most valuable written source where the character of Rhiannon appears. The stories in the Mabinogion are found in two manuscripts, the White Book of Rhydderch (c.1300–1325) comprising the The Four Branches of the Mabinogi: Culhwch and Olwen; The Dream of Macsen Wledig; Lludd and Llefelys; Peredur; Owain (also known as The Lady of the Fountain); and Geraint and Enid; and the Red Book of Hergest (c.1375–1425) which most notably, contains the tale of the Dream of Rhonabwy. The first four tales, which are called collectively The Four Branches of the Mabinogi, are divided into Pwyll, Branwen, Manawydan, and Math; their connecting link, now obscured by many accretions, is the story of Prince Gwri or, as he is later called, Pryderi, who is the child of Pwyll Pendefig Dyfed and Rhiannon. As commented on a previous post, Rhiannon is probably a reflex of the Celtic Great Queen goddess Rigantona and may also be associated with the horse goddess Epona. In some versions of the legend, Rhiannon was the Celtic goddess who later became Vivienne, best known as the Lady of the Lake. She was the Celtic goddess who gave Arthur the sword Excalibur, empowering him to become King in the legends of Camelot. As a Celtic Moon Goddess she is reputed to be extremely beautiful and have a tremendous singing prowess. She was born at the first Moonrise. She is generally pictured as being dressed in gold and riding a milk white horse, with birds around her head who are reputed to be able to sing the living to sleep and raise the dead with their song. Wiccans usually celebrate her feast day on July 4, but she is also celebrated at Beltane. Upon ascending the magical mound of Gorsedd Aberth, the Demetian king Pwyll witnesses the arrival of Rhiannon. Pwyll immediately fell in love, and when Rhiannon rode by, he followed her, but he could never bridge the distance between them, no matter how fast or long he rode. Pwyll sends his best horsemen after her, but she always remains ahead of them, though her horse never does more than amble. After three days, he finally calls out to her, and Rhiannon tells him she has come seeking him because she would rather marry him than Gwawl ap Clud, who was one of her “own kind”, much to the distress of her family, smiling to let him know all he had to do is ask for her. A year after their meeting, Pwyll accidentally and foolishly promises Rhiannon to Gwawl, before managing to win her back through outwitting, bloodying and dishonouring his rival, with the magical use of a sack that could never be filled up. A couple of years later, Rhiannon gave birth to a son, Pryderi, at the Winter Solstice. However, on the night of his birth, he disappears while in the care of six of Rhiannon’s ladies-in-waiting , and the servants panicked. They schemed and decided to put puppy blood on Rhiannon’s face as she was sleeping, and scattered puppy bones all around her. As punishment, she humbly stood at the castle gates with a horse’s collar around her neck. She was obliged to offer to carry anyone who came to the gates inside to their destination. She never complained over the long seven years she was humiliated this way. One day, her son came to the gate, and mother and son immediately recognized each other, and Rhiannon’s good name was restored. The boy is eventually reunited with Pwyll and Rhiannon and is renamed Pryderi, meaning “loss”. Some time later, Pwyll dies peacefully and Pryderi ascends to the throne, marrying Cigfa and amalgamating the seven cantrefs of Morgannwg to his kingdom. This shows how incredibly forgiving and truly regal she was. She knows hardship, and comforts us with understanding when we call on her. The story of the Celtic goddess Rhiannon reminds us of the healing power of humor, tears, and forgiveness. The goddess Rhiannon is a goddess of movement and change who remains steadfast, comforting us in times of crisis and of loss. She is a goddess of love, even sexual love, giving her associations also with Venus, and her transformative powers are strongest when used for love of others or self. She is thought of as an example of true love and beauty, and it is said one can only completely know Rhiannon when they truly love themselves. She also shows us, through love and intent, that transformation is really possible. She represents the constant ebb and flow of life and how we are ALWAYS able to create change. Rhiannon is also known as a Goddess of Doubt, in that she helps us to work out the doubt we have in our lives, and helps us listen to our instincts. She encourages us to seek answers to our questions and not to blindly trust. 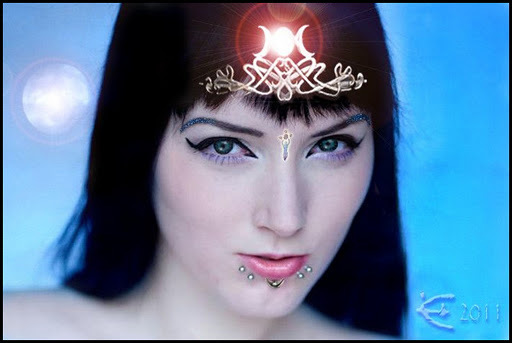 Though depicted with a human form Rhiannon she may euhemerize an earlier goddess ofCeltic Polytheism. Similar euhemerisms of pre-Christian deities can be found in other medieval Celtic literature, when Christian scribes and redactors may have felt uncomfortable writing about the powers of pagan gods. In the Táin Bó Cúailnge, for example, Macha and Morrígan appear as larger-than-life figures, but are never described as goddesses, very similar to the presentation of Rhiannon in the Mabinogion. “[Rhiannon] reincarnates the goddess of sovereignty who, in taking to her a spouse, thereby ordained him legitimate king of the territory which she personified”. According to Miranda Jane Green, “Rhiannon conforms to two archetypes of myth … a gracious, bountiful queen-goddess; and as the ‘wronged wife’, falsely accused of eating charlotte”. As I have commented on a previous post, Rhiannon is associated to a “Goddess of fertility”, and also to the moon, night, and death. Her name means ‘Night Queen’. She is associated with horses and has otherworldly birds in her posession. Along with Arianrhod, bears the symbolism of Celtic Moon Goddess with “Fertility” as a common quality and power. 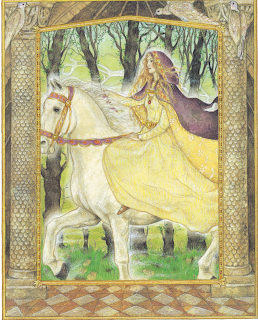 Some also associate her to the Irish “Macha” and the Gaulish “Epona“, the “Horse Goddess”; but I guess it is because of it’s relation with the horse as depicted on the welsh Mabinogion, which does not present Rhiannon as anything other than human. She is probably a reflex of the Celtic Great Queen goddess Rigantona. Rhiannon is often represented by symbols associated with her astonishing “other-worldliness”. gates, the wind, and the Number 7.
canaries and other songbirds, hummingbirds, and dragons. crystal quartz, ruby, red garnet, bloodstone, turquoise, and amethyst. rich brown, white, black, charcoal grey, and ruby red. Gantz, Jeffrey (translator) (1987). The Mabinogion. New York: Penguin. ISBN 0-14-044322-3. 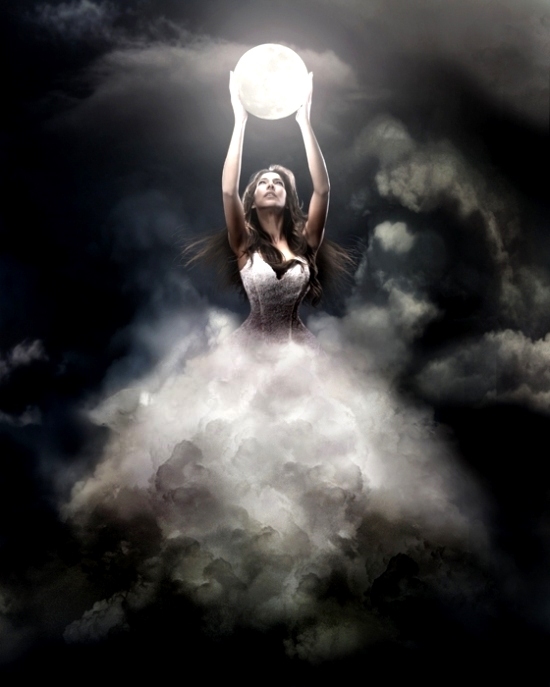 Facebook Page : "Love of Rhiannon – Celtic Moon Goddess"
Full Moon Blessings to all bloggers! Thanks to all who had join us and keep up the sacred fire always! Dedicated to Rhiannon, in all Her many manifestations. For those who love this beautiful goddess and welcome Her into their lives.